Pompeii is an archeological site on the Bay of Naples. The site is considered one of the best preserved ruins in the world and has provided an amazing insight into the daily life of people during the height of the Roman Empire. The city is so well preserved because it was buried in ash during the 79 AD eruption of nearby Mount Vesuvius, which also buried the nearby port city of Herculaneum in mud. The city was lost for generations although rumors of its existence were known throughout the lands. After its rediscovery in 1748, almost 1,700 years after the eruption, it has inspired many works of art and dreams that have affected most of western civilization. Pompeii was only declared a UNESCO World Heritage Site in 1997. No trip to Italy is really complete with out a visit to this amazing famous ruin. Pompeii is a city that was founded most likely during the 7th BC century by the Osci, a people that originated from central Italy. The city was located on an important cross road between several cities and it quickly became a trading centre. The city was conquered first by the Etruscans, the later by the Greek colony of Cumae when it was allied with Syracuse sometime between 525 and 474 BC. During the 5th century the Samnites conquered the city bringing it more modern architecture and enlarged the town. After the Romans took over the Samnites in the 4th century the citizens of Pompeii gave in to the power of the great Romans of the north and was officially annexed by them in 89 BC. By the first century AD the city had grown into a major urban centre. 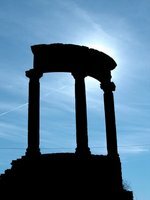 During the Augustan period Pompeii saw a major upgrade in its civic structures including an impressive amphitheater, a swimming pool, an aqueduct that service over then 25 public fountains, several public baths and large residential areas. The city grew mainly because it was trading centre for the area and because of the nearby port of Herculaneum. The city was rife with tension between the classes, which can be seen among the different living areas of rich, poor and slaves. At the time of the time of the eruption the city had close to a population of 20,000. Quakes have been common place for the people of Pompeii as is for the current day population of the area. The big warning came though several years before the eruption when a large quake shook the city in 62 AD. The quake damaged every building in the city and some believe led to a depopulation. Some even theorize if the city had not been destroyed a few years later it would have died on its own because of the major earthquake. Evidence of this is from the fact that many buildings were never fully repaired or were just abandoned after the quake of 62 AD. This will never be known because in AD 79 a massive Eruption from Mount Vesuvius sent massive amount of ash down its side onto the suspecting town. This ash preserved the town and allows us to get a glimpse of what a Roman city was like at the height of the Empire. Also it is the only major Roman site that does not have a current city on top of it. The nearby port of Herculaneum was buried in mud and was not rediscovered till later and is even better preserved. The Garden of Fugitives features several of the famous plaster casts of people buried during the eruption. These were created because after the ash hardened the bodies and bones of the people decayed but the cavity of where their bodies were remained. While excavating if teams come across cavities they inject it with plaster or sometimes now concrete. The Lupanar is a brothel with some naughty frescoes. The Amphitheater is one of the best persevered in Rome. The echos of long gone gladiator combat can still be heard along its walls. It was was also the site of a famous riot in 59 AD that was one of the clues, before the rediscovery of the city, that let scholars knew it existed. This riot was so extensive that games were banned by the Emperor for 10 years! Temples are scattered throughout the city and some feature great frescoes but most of the artifacts are now in Rome or Naples. Cafes from ancient times litter the city and give a real sense of what daily life was like. Bathhouses for men or women are in prime shape. Some feature amazing tile work and you can still see the different pools. Also in some of the bathhouses it is possible to see the ancient in the floor central heating system that was used. Stray Dogs dominate the site and sleep everywhere. They are extremely friendly and just let them be. Farms on top of the unexcavated parts of the city there are small farms to prevent illegal digging. Pompeii is open daily 8:30am-7:30pm, November to March 8:30am-5:00pm. Note that the ticket office stops selling tickets 90 minutes before closing time. Tickets are €11 per adult and a discount applies if you you are under 26 and an EU citizen. It is €20 for a five-sight pass (including Pompeii and Herculaneum available, valid for 3 days). To get to Naples in the first places, the Naples Airport has extensive services throughout Italy and the rest of Europe. Pompeii is accessible from the Circumvesuviana line from both Naples and Sorrento. 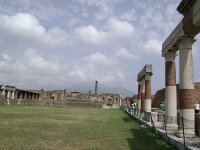 The nearest train station to the site is Pompei Scavi, though the Pompei Sanctuario stop is also within walking distance. The journey takes 30-40 minutes from either direction and costs €1.80 to €3.20. Check the timetable for more information. SITA runs buses to/from Naples and the price is comparable to that of the train. Walking around is the best way to experience Pompeii. The site may be big, but walking is the only way to get around. Bring water with you and feel free to try some of the delicious iced fruit drinks that are sold at the entrance. Be prepared to give several hours to this and going in the morning before it gets hot is a good idea because there is very little shade. Also note that most of the sites are not handicap accessible. There are several overpriced restaurants serving ok food at the entrance. It is your only option. This is version 18. Last edited at 13:44 on Aug 22, 16 by Utrecht. 8 articles link to this page.